Senator Susan Collins of Maine spoke with reporters on Capitol Hill. She hopes to influence House Republicans to move toward a bipartisan solution to end the shutdown. WASHINGTON — The call was urgent. A Democrat was on the other line. Someone Senator Susan Collins has been trying to negotiate with in her emerging role as a dealmaker addressing the government’s twin fiscal crises. “Sorry, I have to take this,” Collins said. And with that, the very much in demand Republican from Maine was gone. In a city that has been politically paralyzed by gridlock, perhaps this call would be a key to breaking the impasse that has kept hundreds of thousands of federal workers at home and unsettled financial markets as the nation hurtled toward possibly defaulting on its debts for the first time in its history. Collins, one of only three Republican senators to vote for President Obama’s economic stimulus bill back in 2009, is one of the remaining links to a moderate brand of the Republican Party, and is increasingly seen by the White House as a potential player in solving the crisis over the government shutdown and raising the debt ceiling. Obama spokesman Jay Carney on Friday singled out Collins as one of those providing “constructive” ideas. Lawmakers sounded more optimistic on Friday, but they have so far failed to reach consensus on how to end the impasse that has crippled the government. Her profile has risen in recent days, from first pitching her plan for reopening the government to C-SPAN cameras in a nearly empty Senate chamber last Saturday to an audience with the president at a Friday White House meeting between Obama and Senate Republicans. Collins said she spoke at length about her plan during the two-plus-hour meeting. 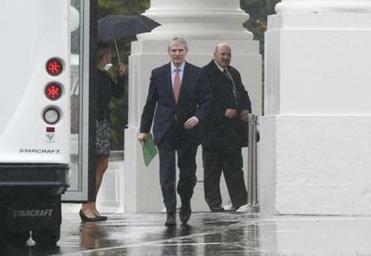 Tea Party-affiliated Republicans, including Senator Ted Cruz of Texas, also attended the White House meeting. But a small number of centrists like Collins are willing to challenge their influence, criticizing the GOP’s strategy of tying government funding to dismantling Obama’s health care law as unrealistic. Under the framework Collins helped develop, the government would be reopened and funded for six months. The debt limit, set to expire Oct. 17, would be extended until Jan. 31. In exchange, Democrats would agree to delay for two years a 2.3 percent tax on medical devices that helps fund Obama’s health care law. Collins, a “Yankee Republican” who is fiscally conservative but holds socially moderate views, plays a unique role in the current Republican drama at a time when a strong Tea Party faction has pushed the GOP — and its leadership — to the right. She hopes to influence House Republicans to move toward a bipartisan solution to end the shutdown. Collins, 60, said she is concerned about the GOP’s direction as it increasingly becomes seen as a party dominated by members from the South and West, thick with lawmakers who refuse to compromise. “We need bridge builders in the Senate,” she said. Collins said she “completely disagrees” with the Tea Party strategy. “That could never succeed as long as there was a Democratically controlled Senate and as long as President Obama is in the White House,” she said. Last Saturday, Collins sat alone in her one-room “hideaway” office in the Capitol, listening to the speeches her colleagues were delivering on the Senate floor and growing angrier by the moment. “Both sides were so partisan. They were simply lobb ing grenades,” Collins said. She hadn’t planned on speaking. With much of her staff furloughed, she quickly devised a proposal to break the gridlock and marched down to the Senate chamber, presenting it to the cameras. Her Republican colleagues began calling, asking about specifics. Senators Kelly Ayotte of New Hampshire and Lisa Murkowski of Alaska signed on, she said. So did Senator John McCain of Arizona. Earlier this week, after she talked again on the Senate floor, Cruz approached her and suggested that she add another provision to affect the health law, defining full-time workers as those working 40 or more hours a week. Under the law, large businesses need to provide health insurance to full-time employees, defined as those working 30 or more hours as week, beginning in 2015. The change would markedly limit the law’s sweep. She thanked him, but demurred. “I thought that would be a bridge too far for the Democrats,” Collins said. Collins has fielded calls from Democrats, including Senators Jeanne Shaheen of New Hampshire, Amy Klobuchar of Minnesota, and Joe Manchin of West Virginia. None of the Democrats has publicly supported Collins’s proposal, but they have suggested tweaks, she said, including a conference on the long-pending budget immediately after the impasse breaks. Collins has cultivated her relationships with Democrats during monthly bipartisan dinners with women senators, who take turns hosting. 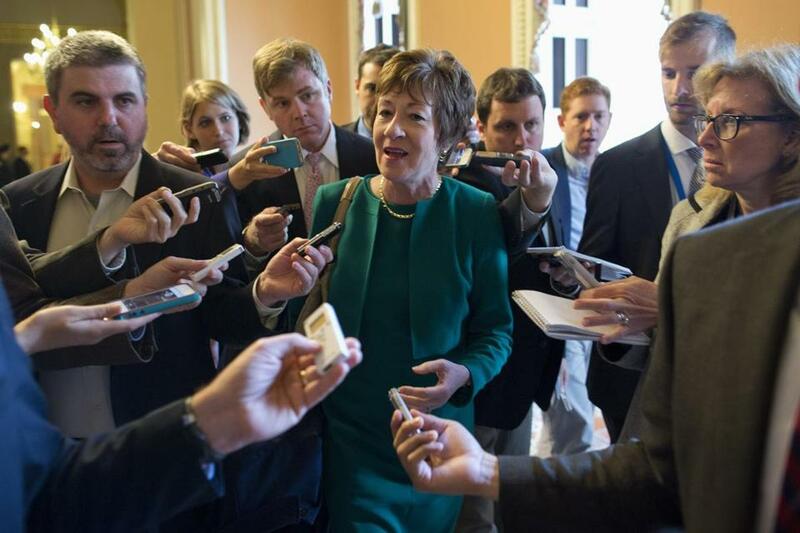 “A lot of these Democrats are talking to me without necessarily telling their leadership,” Collins said, referring to the urgent call she took Friday afternoon. Senator Jack Reed, a Rhode Island Democrat, called her a “valuable partner” with whom he has had a productive relationship. Senator Angus King, an independent from Maine, has known Collins for 25 years and come to “appreciate her guts, frankly” since he joined the Senate this year. “She’s always been independent-minded, not an insider with the old boys of the Republican establishment in the Senate,” King said. The two spoke Thursday evening about the provisions in her proposal, but he has not explicitly signed on.